Conducting online research on moving to Mexico can be overwhelming, especially when it comes to the argument that you shouldn’t move to Mexico because it’s too dangerous. In spite of what people who actually live in Mexico say, it's easier to passively digest whatever article happens along your path than get the facts, as politics in the last 10 years has shown us. Like in the U.S, Mexico is safe with the exemption of certain cities or neighborhoods. A few of the most dangerous cities in Mexico have always been dangerous, border towns like Cuidad Juarez and Tijuana for example. Even in those cities, seasoned travelers know that the chances of an incident statistically is small. Stories about Tijuana are the stuff of legend, dating back to when some of our grandfathers were young and coming down here to raise hell. Honors for “Most Dangerous” shift from year to year somewhat in both countries. If a Mexican was investigating moving to the U.S. in 2019 he would probably want to avoid the cities of St. Louis (highest murder and aggravated assualt rate), Little Rock, Springfield and Albuqurque and Memphis if he were to approach traveling in the U.S. the way Americans approach traveling to Mexico. Of the 10 most dangerous cities in the world, none are in the U.S. and only one, Alcapulco is in Mexico. Oddly, lists differ, with New Orleans, Detroit and Baltimore still on top of some lists. Latin America does have the distinction of being the most dangerous continent, and news agencies like to paint all countries in Latin America with the same brush, as when Fox News’ headline brayed in 2016, “Mexico Home to 5 of World’s Deadliest Cities” and went on to say the deadliest of the five was in Honduras, which of course is a different country, but what the heck, it was accurate enough for Fox News. Reading forums can be another source of misinformation, because some expats like to speak for all of Mexico. Knowing things change from year to year and I hadn’t checked my own city of Mazatlán in several years, one day I thought I might review what expats said about it. Since I live in Mazatlán and have for several years, the fact that drug cartels had "killed" Mazatlan came as big news to me reading the post. The city recently received massive renovation of the malecon, with new lighting, new trees and street lighting throughout El Centro. Prices are going up, up as wealthy Mexican nationals move into the renovated coastal town. It certainly didn’t seem the battle zone Cozumel Deb reported. I was so alarmed by the post that I called my associate, The Intrepid Elise, a property manager who has lived here for 15 years for clarification. If people were heading out, she'd know. “No…I really never noticed any thing really different...” she said (along with the tone that implied, “You of all people should know better….”). Elise is accustomed to silly inquiries about safety from skittish and uninformed new expats. She was probably more than a little surprised to get one from her business partner who lives four doors down the block from her. Still paranoid that all this violence was going on right under my nose, I called my Mexican friends and asked them if there was a conspiracy to keep murders and violent crime out of the news and keep expats in the dark. They too, seemed surprised by the question. Drug violence is not part of their day to day lives any more than violence would be part of your life just because your city had a housing project. Like every major city in America, Mazatlán will always have neighborhoods I wouldn't take a bus to. CozumelDeb´s post illustrates a number cognitive challenges that arise when you do research on where to live in Mexico. One of the hardest is resisting what is known as the “availability heuristic” or “availability bias.” The availability bias is “a human cognitive bias that causes us to overestimate the probability of events associated with a memorial or dramatic occurrence." It is basing a judgement on the most readily accessible or recent information, while not necessarily the most accurate information. Only bad, yet more colorful news about Mexico makes major American papers. The more horrific stories are enthusiastically passed from vacationer to vacationer. Those stories are more available (because they are more sensational, and a better story) than boring accounts about millions of vacationers having a great time and returning in one piece. An estimated 1 million Americans live in Mexico, along with about 500,000 Canadians. You will meet many Europeans who like the sunshine too. Over 10 million people visited Mexico in 2018 on vacations, business or study. The rare incident has more journalistic legs than these statistics. Another challenge is that people don’t have a sense of how big Mexico is. If you were trying to research moving to Tampa, Florida, you wouldn’t trust information provided by someone who lived in Baltimore. You would want to talk to someone who currently lived in Tampa. The fact that Cozumel Deb lives in the country of Mexico somehow gives her credibility in spite of the fact we wouldn't look to a New Yorker to tell us about Dallas (although a Mexican might.) It's nearly irresistable to become the resident expert on Mexico to the folks back home by virtue of just living in the country. Another problem is that the State Department warnings are for entire states of Mexico, a country with 31 states and one federal district, and don't break the advisories down by region or city. According to the State Department, the following are the most dangerous states (4) in Mexico in 2018, none of them have ever been tourist destinations for Americans. Most of us would guess a big difference between living in Alexandria, Virginia, a few metro stops from Washington, DC and its famously violent areas. Even within the same city, we may not worry as much about crime 10 miles away from our homes in the U.S. My house in Richmond’s Fan, the city’s wonderful historic district was less than two miles away from the public housing community where a family was slaughtered in 1994. Yet travel warnings don’t mark the distinction between Mazatlán, Sinaloa and Culiacan, Sinaloa. Culiacan is the capital of the state of Sinaloa and does have more violence. Culiacan is about the same distance from Mazatlán as Washington D.C is from Richmond, Virginia, two areas of which have nothing in common other than both being inhabited by human beings. Advisories frequently paint the brush over an entire Mexican state even when the danger may be limited to a city, or even to just certain rural roads around a particular city at night. For a quick fact sheet, take a look at the site, How Safe is Mexico, which makes much better distinctions within the states. Where you are and how you act are the main factors in determining how safe you will be in Mexico. The only way to know how safe you will feel is to talk to people who actually live there and visit for awhile. As any season traveler knows, whether you are in Obregon Mexico or New Orleans, the chances of trouble of statistically slim, especially if you use common sense. When you get there, make some friends, keep your eyes open, check how old the information is and above all, consider your sources. "477 Days, 521 Mass Shootings" - a report from the New York Times following the Las Vegas shootings. And you're wondering if Mexico is safe. If you get shot and killed in the U.S., the person is likely to get away with it. A shocking number of murders in the U.S. go unsolved. People read a lot of stories about kidnapping in Mexico. Mexico Mike tells it the way I would. According to this story, burros and cobblestones are the among the Top Ten Most Dangerous Things about Miguel San Allende, one of the most popular expat destinations in Mexico. Up next: The retirement crisis and you, together at last. 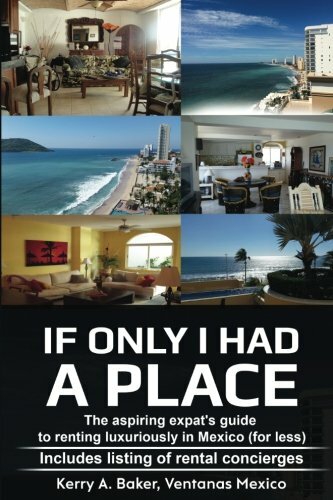 I'm Kerry Baker and a partner with Ventanas Mexico which provides insight and resources to those considering expat life in Mexico, including a guide on renting, "If Only I Had a Place." Renting long-term in Mexico is different, no matter what realtors tell you. It has advantages and disadvantages to renting in the U.S. Do your homework and get a listing of rental concierges who can preview places for you before you sign the dotted line. 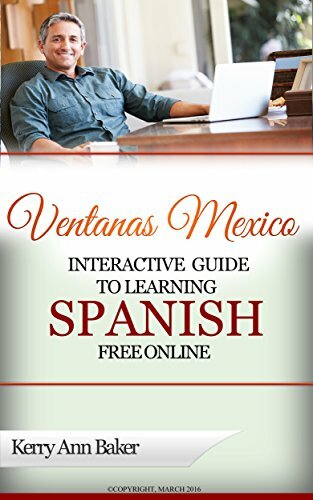 The "Interactive Guide to Learning Spanish Free Online," a curation of the best Spanish language tools on the web, organized into lesson plans by level. Interactive links take you to the best features and sites, researched from over 300 sites. Create a new lesson plan every day, like I do, or use the study plans in the book. Don't be an expat who doesn't speak any Spanish! Get started with the guide and your laptop, e-reader or tablet, like the Kindle Fire.